Cape Breton | Great Scot! Wait a minute…weren’t you just in Canada? Just a quick note to let everyone know that GreatScot! is in San Diego! For those of you wondering what happened with the rest of my vacation trip in Cape Breton, Nova Scotia, never fear—I will eventually get those posts completed. I have lots of great pictures and stories to recount. However, the Outlander Premiere is rightly interrupting all previously scheduled programming. The trip began this morning with me meeting Tricia Leedom, Heughligan, in the gate area of the Atlanta Airport. Sorry there aren’t any pictures of this meetup, but I’m pretty sure we never stopped talking from the point I arrived until the gate agent started boarding the plane. I never even thought to take a picture. Once I boarded, I made the now obligatory tweet to Terry Dresbach with the shoe picture. For those who may not know, Terry began the tradition of taking pictures of her shoes almost a year ago when this journey began. I now feel obliged to do the same every time I begin an Outlander related journey and it always makes me smile. Oh, the places these shoes have been and the stories they could tell. But, then again, that’s why this blog exists. Once in the air, I passed the time with the inflight Internet service making sure that I didn’t miss any of the great pics coming from the lucky ComicCon attendees. I also managed to snap a couple of pictures as we crossed the desert east of San Diego. Once I had deplaned, I hung around in baggage claim waiting for my companion for this weekend’s adventure. Soon enough, she had also arrived and we made our way to a taxi for the ride to our hotel. Thanks to the craziness that is ComicCon in San Diego and the exorbitant price of downtown hotel rooms, we are staying about 10 miles north of the downtown area—where I can use hotel points for a no cost stay. Nothing beats free! Luckily, I have the Uber app on my phone to help us get around economically. 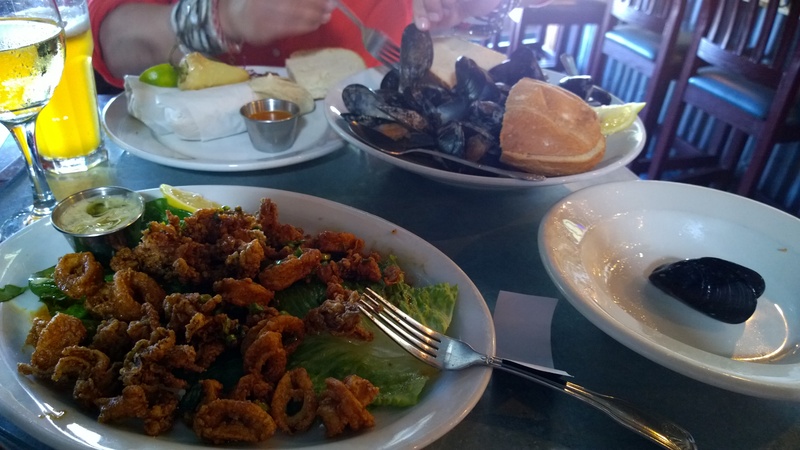 Fish Tacos, Calamari and Mussels…oh my! Once we settled into our hotel, our thoughts quite naturally turned to food as neither of us had eaten much all day. We decided to head downtown to the Gaslamp District for some food, so I put my trust Uber app to use and within 4 minutes Scott had shown up to take us downtown. Turns out Scott was a retired TWA airline pilot who drives for Uber to stay out of his wife’s hair. She told him he had to stop hanging around the house so much after he ate some wine and cheese destined for his wife’s book club. And, get this, the book that was going to be discussed at that meeting was A Breath of Snow and Ashes. You just can’t ever get too far from an Outlander reference, can you? I’m sure his wife is going to be very jealous when he tells her of the two girls he carted around today who are going to the premiere tomorrow evening. Another strong point in Scott’s favor is that he pointed us to the Bay Park Fish Company for their 3-6 pm Happy Hour. Marisa and I gorged ourselves on Fish tacos with Mahi Mahi, Mussels steamed in coconut milk and lemongrass, as well as Kung Pao calamari. Everything was splendid. Scott even hung around the area so he would be available to take us back to the hotel to rest up before a night on the town. Can’t be out too late though! Lots to do tomorrow and we’ll need to be well rested. Tomorrow is D-day! I’ll catch you up on any of tonight’s activities worth mentioning and have extensive coverage of all the events at the Outlander Premiere. People keep asking me what I’m looking forward to most. Obviously, I’m very excited to actually see the first episode and all of the cast plus Ron and Diana. But even more than that, I think I’m most looking forward to is the live performance by Bear McCreary of some of the music for the Outlander series. For those of you who may not have seen it, Bear recently published a piece on his website titled “Outlander Fans’ Guide to My Music” where he details some of the steps in his life and career that have led him to this project. It is obvious from reading it that he truly has a passion for the music of the era Outlander encompasses. I can’t wait to hear more from him as he has promised as many blog posts during the Outlander season as living with a newborn baby will allow. Stay tuned. I have a feeling things are going to be verra exciting tomorrow! One of the best things about visiting Cape Breton Island, Nova Scotia is experiencing cultural traditions that were transferred from Scotland to the new world with the emigrant wave of the 18th and 19th centuries. This is especially true since some of these same things have all but died out in Scotland itself. Although I’ve been coming to the island every summer for the last 15 years, I have enjoyed experiencing these now familiar activities through the lens of the GreatScot! blog. Among my favorite traditions are the almost daily Celtic Square Dances that are held in Parish Halls and Recreation Centers around the island. Almost any night of the week you can find a dance somewhere—Mondays are Brook Village, Thursdays are Glencoe Mills and West Mabou on Saturday nights. There are groups of people ‘from away’—as Cape Bretoners call tourists— and locals as well, who spend the week going from dance to dance to enjoy the fiddle music and take to the floor for a set or two. This year, a new community has joined the weekly line-up as Creignish has added a dance on Tuesday nights. No one on the island seems to know quite how these dances migrated from Scotland, but they are common all around Cape Breton and even on mainland Nova Scotia. Cape Breton Square Dances usually start fairly late by modern standards—generally after 9:30 pm. This is because in the days of farm laborers and fishermen, no one had time for a dance until after a full days work was finished. The dances also follow a fairly regular pattern, although the origins are somewhat shrouded by time. First the fiddler and the piano accompanist take the stage for a bit of a warm-up, then they launch into the first jig and couples take to the floor. Often fiddlers will trade-off playing as one tires and another takes over. Towards the end of the evening, when the dancers are tired as well, often the floor will clear and individuals will take the floor one at a time for a spot of step dancing. This is the chance for the good dancers in the crowd to kick up their heels and show off for a bit. In the area of Cape Breton where I spend the most time (the western or Sunset side of the island), the dances consist of 3 figures danced to the tunes of two jigs and a reel and are known as Inverness County Square Sets. Couples form squares (which are often really more round) to perform the figures. Jigs are tunes that are faster paced and in addition to being used for the 1st and 2nd figures of the square dancing, are also often used for solo or small group step dancing. I took some pictures and some short videos from the Creignish dance to give you a taste of what a traditional Cape Breton Square Dance is like. The musicians for this evening are Wendy MacIsaac on the fiddle and Mac Morin on piano. Notice that all ages and skill levels take part and that native Cape Bretoners are really good about helping people from away join in and learn what to do. That’ll be it–That’ll be all! lineup and split the couples down the middle. a few times and show your steps. face the back of the hall. 15. Repeat number 7 returning to the back of the hall. partner by and going all the way to home. 19. All join hands and show your steps! Coming soon is a post about my visit to the Cape Breton Highland Village Museum—where I met a blacksmith named Jamie—as well as one on my upcoming visit to The Gaelic College for a Great Kilt demonstration and the opportunity to partake in a milling frolic.